In the future America is under the leadership of America’s first black president. The United States at war, and fighting all over the globe has few members of our armed forces at home, certainly not enough to protect the country. The land of the free and home of the brave must navigate through dire straits! Lisianna Rockefeller the wife of a congressman and a popular journalist becomes enmeshed with a group known as the Consolidated Citizens Corp, or commonly known as the CCC, and a man known only as X involved in smuggling people out of Crooked County that are on the list of suspected persons. They will certainly meet with a bad end if not taken to safety. The Lemegeton– the Agent of the Devil reveals secrets or shows the events of the past, present and future, and finds things that have been lost or stolen. This certainly fit into Jay Wilkes agenda in a most perfect way. The Lemegeton also lusted after the daughters of men and it was Wilkes lust for Lisianna during the dinner at the mansion of Raymond Randolph that was the motivation behind X letting his own demon out. Jay Wilkes is the commander of the special Task Force assigned to catch Lisianna Rockefeller who was forced to flee Crooked County. The famed journalist and wife to a well known congressman and senators son, Lisianna Rockefeller was hunted by the Agent of the Devil Jay Wilkes. But, Lisianna had a secret friend. Her friend was truly king of his realm. The dark beast that was always watching Lisianna was only a shadow to others. Was the mysterious creature merely a shadow or maybe only a ghost? Lisianna stands proudly for rights of the common man, the American Dream! Almost without realizing it she found herself falling in love with the leader of the secreted CCC. Torn by her new love of X and her husbands love for her. Lisianna only had her dedication to the cause, to her country, and to an American Dream. Only her America was at war and South Carolina threatened secession. 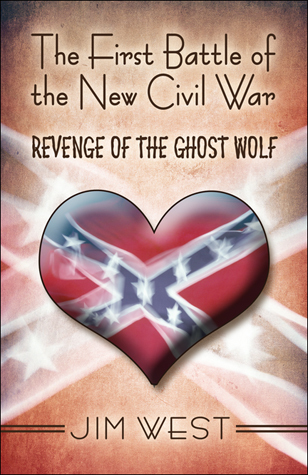 Get YOUR Copy today of Revenge of the Ghost Wolf and tell your friends!